As a kid, I remember a cousins’ plan to buy the LaBrake farm. The meetings typically would take place at The Farm on a holiday or a Saturday evening visit. As I recall, the discussions usually involved my brother Will, my cousin Stephen, my cousins Julie and Tammy, and on occasion we would allow younger siblings to attend these impromptu meetings. It seemed like we were discussing how all of us could live at The Farm at once, if I recall correctly. There were a lot of rooms in the 2-story house and lots of land around it so it’s reasonable to think we felt there would be room for everybody. Or maybe we talked about buying The Farm and taking turns living there. Timeshare Farm! I think anyone who took their turn in the summer would automatically be responsible for all the haying demands. Oh, I really wish I could remember the plan, and nobody ever wrote it down. You can probably guess our Timeshare Farm idea never became a reality. As we grew older, The Farm still held a special place in our hearts, but the idea of buying it was never brought up. I suppose it was replaced by other interests we each had developed in our teenage and early adulthood years. Some of us got married. Some found a steady job in the workforce or the military. Others went through a string of relationships or bounced from job to job. By the time The Farm was being sold, not one of us had the funds or the focus to make that earlier dream come true. This month marks ten years since I was last at The Farm. My Grandpa died that month, and all 14 of his children, many grandchildren and great-grandchildren came together to mourn the loss of our family patriarch. I didn’t want to leave. I knew that visit would be the last time I went into the house, as it was, and walked through the barn, as it was, passed through the machine shed and the garage. The whole place would be different eventually, and I wanted to absorb as much of it as I could. In the month following my grandfather’s death, my wife and I moved from Albany, New York to Houston, Texas. The distance away from family felt painfully long in the days following the 9/11 attacks, and made it difficult to visit home in the months ahead when the business of auctioning items from The Farm and selling the property was underway. Of course, it’s not there to see. Sure, the house is still there but it’s not the same house, really. Someone outside the family owns it these days. I’ve been by it a couple times during trips to see my parents. I think I even took Aidan over there once when was very little so I know she has no memories of it. Perhaps that’s the most profoundly sad part of the story for me. I can go to The Farm anytime, in my mind, but my daughter will never know the place the way I did. She was born almost four years after my grandfather died. But knowing her, she would have relished a visit to her great-grandfather’s farm. She would have wanted to explore every bit of it, just like her daddy did starting almost 40 years ago. I can see her wanting to help unload hay, just like her great-grandmother did for years. I imagine she would sneak into the machine shed, just her like daddy did, to play hide and seek and climb on equipment that we knew was dangerous to be around, just for the thrill of it. She might even try to climb a silo, like her daddy and Uncle Will did—until Grandpa caught us and “convinced” us to come down. She would find some of the same books in the living room, from decades ago, and enjoy them like I did. She would mingle with her grandmother and great aunts in the kitchen, wanting to help cook the large meals necessary to feed so many people on a holiday. She would love every kid she met and ask every time if she could have a sleepover. She might accompany her great-grandfather on trips to the diner down the road and offer to help in the garden. She would have wonderful memories and the smell of Cedar trees anywhere else in the country would always make her smile and cry a little bit. Now at least she’s been there, in my mind. Please visit the fundraising page of my latest book project, Outside the Touch of Time, and consider making a donation. Your support will help us preserve stories of the love, lessons and longevity of 14 siblings born between 1933-1955. The summer of 1955 marked the opening of Disneyland, the launch of the Guinness Book of World Records, and the fury of Hurricane Diane, which killed more than 200 people along the East Coast of the United States. The damage in its wake was estimated at three billion dollars, making it the first billion dollar storm. Although it affected parts of New York State, the heavy rain and flooding was not seen in the upper reaches of the state where my mother was living with her parents, sisters and brothers. No doubt, they heard reports of the hurricane, but the LaBrake family farm in Lisbon, New York was unaffected. I look back to summer of 1955 because that’s when my mother was the same age as her only grandchild is now. Of course, six was very different back then. But available technology aside, the lives of my six year old and her grandmother-at-six are vastly different in other ways. My mother at six had lived in only one house. My daughter has lived in three houses and two apartments, counting both the residences her mother and I shared and the ones we live in separately. My mother grew up with 13 brothers and sisters. Because they were born between 1933 and 1955, not all 14 siblings lived at home at any one time. My daughter is an only child. She’s also my parents’ only grandchild. None of the sisters and brothers with whom I was raised has a child yet. My mother’s parents had been married for 23 years by the summer of 1955. My daughter has been experiencing the divorce of her parents for two and a half years now. My mother had not flown by age six, whereas my daughter has flown numerous times between Texas and New York, most recently flying from Dallas to Buffalo with her mother in July. Her first trip by plane occurred in October 2005 when we flew to New York to spend a week there. At age six, I’m sure my mother wasn’t allowed to use the telephone. My daughter has been using a cell phone since she was a baby when she would occasionally call her grandmother by chance with the press of the right sequence of buttons. While these differences are noteworthy, what’s more important is the shared family heritage. My daughter is a LaBrake, not by name but by blood. She has a right to hear the family stories and get acquainted with the family members. That’s been challenging to do while living in Texas. Most of the family lives in New York State and we rarely get visitors here. But there is a solution in the works. No, I won’t be moving home anytime soon. I haven’t decided to buy back the family farm either. I’m also not petitioning the state of Texas to switch places with New England. However, I am developing a book project that will allow for a lot of family time for both me and my daughter. The book, called Outside the Touch of Time, will share stories of the 14 LaBrake siblings, starting with their childhood and spanning decades until the present day. I plan to interview each person in his or her home in the coming months and finish the book in time for a launch in 2012, the year marking 80 years since my grandparents got married at the tender age of 18. 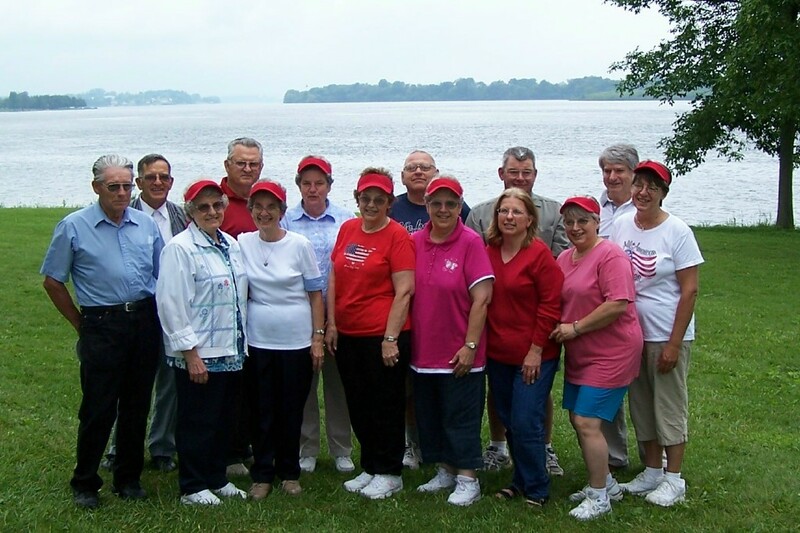 All 14 LaBrake siblings gather along the St. Lawrence River in Lisbon, New York during the family reunion of 2008. Rather than conduct phone interviews, I plan to see my mother and my aunts and uncles in person. Trips to New Mexico, New York and New Jersey will be necessary as each of the 14 siblings lives in one of those states. Isn’t it odd that nobody lives in a non-New state? Family photos will be an essential part of the book, and I’m sure I can find a relative to help coordinate that part of the work. I also plan to bring a professional camera to take new photos for the book and its marketing materials. I’ll be bringing something else, too: a digital audio recorder. This will be the only time someone is capturing these stories in any kind of digital format and they must be saved for future use related to the book and future enjoyment by the family. Oh, I plan to bring one more thing: my daughter. I can’t imagine making these trips without Aidan. After all, she is the next generation. I know her presence will help liven up each visit, and her own storytelling skills will be enhanced by participating in this experience. I might even assign her a few duties before, during and after each interview. While family stories and fun facts are central elements for the book, the narrative will place their lives in the larger context of life in America. We’ll look at the rates for sibling survival in the U.S., and hear from a sociology expert about the unusual occurrence of more than a dozen siblings living past the age of 55. The research data will accompany professional observations about the factors that may have contributed to this kind of longevity in one family. Even with a plan to self-publish, writing Outside the Touch of Time will require donations in order to get started. I have set up a fundraising page on IndieGoGo so anyone interested in supporting the project can give whatever amount is suitable for them. You’re also welcome to donate a camera or recording equipment. The deadline for reaching our goal is November 1, and interviews will commence once the goal has been reached. Your support is necessary in bringing this book to life, and I appreciate generosity of any kind. I know my daughter will be pleased, too. She may even want to send you a handwritten thank you note. As the school year came to a close in June, Aidan said goodbye to her elementary school. The plan was to move from Lewisville to Richardson a month before she begins first grade. I felt sentimental during the last time I walked her home after school. We made that same walk so many times, often snacking or sharing a cool drink on the way. Aidan said we could come back from Richardson sometime and do that walk again. I smiled, quietly knowing that her idea would never actually happen. A few variables prevented that move to Richardson from happening, but we got some surprise news this week that still means Aidan will not be going back to the same school. Oh, she’s going back to the same school building. It retains the same name. Yet something else has changed. The latest public school accountability ratings in Texas means my daughter’s school has been downgraded from Exemplary to Recognized. It’s a change shared by many schools around the DFW area and around the state. The story was covered by numerous media outlets, including my ex-wife’s radio station, KRLD, a CBS property. A year ago, the designation of Exemplary or Recognized didn’t matter to me. I wanted her in a good school but I wasn’t aware of the differences. After investing months in her education—and countless hours helping her develop reading and math skills—the change is significant. Even before this news, I was already responding to the normal summertime loss of skills developed in the classroom. Now that I have this news, helping Aidan do homework in the coming year becomes even more important to me. She’s a bright girl and I want to inspire her to challenge herself more inside and outside the classroom. I also want to facilitate her exploration of new subjects and activities. This may be the year she begins to learn to play the piano. We may also consider signing up for a sport, such as soccer. I have a feeling we’ll be watching less TV in the coming year and spending more time engaged in educational activities and outdoor recreation. I’m even thinking of setting up an agreement where she has to earn her hours of TV. I think the new brand of structure will be a valuable part of her experience as a first grader. She doesn’t know anything about the ratings changes. She doesn’t even have an understanding of how different first grade will be yet. She does know that new experiences are coming her way. As August begins, new clothes and new school supplies will accompany the start of a new school year. While she’s enjoying the excitement of all that newness, I will be reminding myself that her school’s new ratings will challenge me to step up my commitment to her education. Sure, I’ll pause to take plenty of pics of her first day of First Grade, then it’s all business from that point on. That reminds me, I also will need something new before the school year begins: a new wallet filled with cash. I wonder if I can find one at Marshall’s. The day after Amy Winehouse’s death became international news, a client of mine emailed me. He works at a long-term rehabilitation facility for addicts and alcoholics in Texas called Burning Tree. He wanted a 300-500 word article about the Grammy award-winning singer’s drug addiction and chronic relapse. I wrote it immediately. While I enjoyed some of her songs, it wasn’t my appreciation of her talents that motivated me to start writing so quickly. Her death reminded me of an addict who spent years in my life, providing some of the worst experiences I remember in two cities: Albany, New York and Houston, Texas. One of the Albany incidents involved discovering him unconscious in his bedroom and struggling to open the door because his body was blocking it. I remember rushing to the phone to call 9-1-1. A 5 am phone call alerted me to an incident a couple years later in Houston. During an apparent drug deal, he had been beaten badly and was in the hospital. At times, I felt like I hated him. He once “borrowed” some of my clothes and left them at a girlfriend’s apartment. She broke up with him and threw out “his stuff” one day, including a pair of slacks and leather shoes that he took from me. At times, he inspired me. He often made gourmet meals for my wife and I, entrees I felt compelled to take photos of because they looked so lovely. And he would make these delicious dishes using whatever we already had in the refrigerator and cupboards. Like Amy Winehouse, his life was like a rollercoaster ride through those years. In addition to taking him to detox, rehab, AA meetings, I accompanied him to court and visited him in jail. He eventually got out, left town, came back, left again, came back, and finally left for good. If he had been a friend, the relationship with a chronic relapser would have ended a long time ago. But he was my brother-in-law. His sister spent years trying to save him, and finally accepted that he wasn’t willing to save himself. He’s still alive, and although I don’t keep tabs on his arrests and jail time anymore, there is a part of me that is still very concerned. That part of me is my daughter. As her uncle, he will always be part of her family story. He’s still an addict. He will always be an addict. Yet knowing that my daughter would benefit from seeing her uncle clean and sober helps me redefine him and the experiences I had that were created by his substance abuse and dependence. Even the most difficult moments become stories I can share with Aidan in the coming years, and provide lessons from which to learn. Meantime, his own life continues somewhere several hundred miles away. I hope he’s okay. I hope he figures it all out. 28 days were not enough. Jail time only helped while he was behind bars. Perhaps finding the means (and funds) to commit to a long-term rehab would have provided a solution years ago. It may still be his only hope. It’s Field Day at my daughter’s summer program. The theme: JERSEY DAY. Last night her mom brought over Aidan’s Boston Bruins jersey, an excellent choice following the team’s Stanley Cup victory over the Vancouver Canucks. So dressed as a little Boston Bruin, with her Chorkie puppy in her lap, she and I set off for the 3 mile drive to the school hosting her summer program. She repeated it a few times before we reached the first STOP sign. Hearing my six year old daughter sing the lyrics of a Black Eyed Peas song isn’t a new experience. She loves the group and she’s sung other songs in the car before. But it was this particular song that made me feel compelled to start a conversation about addiction. After all, one of my writing clients is Burning Tree, a long-term drug and alcohol rehabilitation facility in Texas. Me: Do you know what addiction is? I suspected that answer wasn’t quite true. This girl has an amazing memory. She can recall all kinds of details 24 hours, 1 week, 1 month later. She just needed a little coaxing. I started by explaining how addiction is a dependence on a substance, one that becomes a habit that’s hard to break. She said, “I’m not addicted to anyone or anything. Are you addicted?” I replied, “I’m not addicted to anyone or anything either.” She seemed happy to hear that statement. As we continued chatting, it was obvious that she’s had the addiction conversation before with her mother. Her mom knows more than a thing or two about addiction. In fact, she has a brother who’s been dealing with multiple addictions for more than two decades. I’m sure Aidan has learned a lot by listening to her mother talk about the subject of addiction. One of the points Aidan brought up was her mother’s own addiction to cigarettes. I acknowledged her example and said cigarettes are highly addictive, although not everyone will become addicted to them. For me, I told her, cigarettes are too expensive, taste bad, and have a nasty smell. I’ll never be addicted to them, I assured her. But I also reminded her that her mother has tried to quit and has had managed to stop smoking for long periods of time in the last several years. The only other addictive substance we managed to cover in the short drive was pain killers. I explained how certain types of pain killers are more addictive than others. Her first question was, “have you taken those pain killers.” I told her that I had taken pain killers after my car accidents, but assured her that I never became addicted to them. It’s obvious that she’s trying to gather all the facts here and make sense of the world of addiction, as much as it could ever make sense to a young child. Last night as we looked at the full moon together, she imagined being the first child to “discover the moon.” Today she may be thinking about discovering cures for addiction. I’m sure our brief conversation will be on her mind occasionally throughout the day, although I hope she can set it aside and fully enjoy Field Day. But if the topic comes up again this afternoon, I’ll be equipped with an kid-friendly view of addiction delivered by kids and created by Dr. Robert Lefever, Director of Promis Recovery Centre. I’m sure one view of this 8-minute video will change the way Aidan thinks about that Black Eyed Peas song. It won’t prevent her from singing it again, but she will be a lot more informed the next time she does. Of course, if she comes home singing Beyonce’s “Best Thing I Never Had”, I may have to discuss a radio ban with her mother. Dying is never easy to watch, especially when it seems completely unnecessary. In this case, the process was set in motion by mere neglect. So prior to death would come a period of solitude. It’s a very depressing concept. Dying alone could very well be the worst punishment ever. But this weekend, a live was saved. Death was delayed, hopefully for years—or however long the flowering plant known as a Morning Glory lives. A few months ago, my daughter wanted a plant. Maybe she needed a plant for school. I can’t recall which it was, but I do know that her mom and I took her to Walmart to pick up some seeds, a pot, soil, etc. It seemed like a happy little moment. Then, on the following evening, she would plant the seeds. Unlike the immediate-growing plants in some TV shows, these seeds took their dear sweet time to grow. Aidan was sometimes impatient, often rushing outside to the patio to see if any signs of life were visible. I remember her excitement when she started seeing little bits of green sprouting up through the soil. It was another happy little moment. Somewhere along the way, perhaps due to the oppressive heat in Texas, the plant got moved inside into the cool, air-conditioned environment. It would seem like a blessing, but turned out to be a punishment, albeit an unintentional one. The Morning Glory would feel no glory as it quickly became forgotten for days at a time. After a period of time sitting on the window sill of Aidan’s mom’s room, the little M.G. plant enjoyed a brief revival and spent time in Aidan’s window. The exposure to sunlight every day would be overshadowed by a lack of water. The window sill was again not the place to keep the plant. It lived a life of great thirst—and perhaps confusion. Before Aidan and Bonnie left for New York, M.G. returned to Bonnie’s window sill. An unpredictable life would continue, until death slowly took hold of the little green one, even as it struggled to flower. A week away would seal its fate and M.G. would be deceased and out of its misery finally. But fate intervened. After dropping off Aidan and Bonnie at the airport, I came to their apartment instead of going home. I felt something calling me here. I discovered it was a plant ready to meet its maker and begging for last rites. M.G. looked far older than ever. A painful sight! Some people might have declared it dead on the spot and tossed it in the garbage. But I saw a little bud desperate to see the sunshine, and I felt obliged to help. M.G. could, no would, live a full life, and when Aidan returns from New York, I can tell her about this triumphant experience to save her plant. I will remind Aidan of her duty to take care of M.G. as best she possibly can. Finding a proper home for the plant will be essential. Placing reminders in common areas will be helpful. Prematurely digging a grave for the plant will also effectively deliver the message, but there’s no reason to go to those lengths. Yet. I’m just glad I didn’t give her the seed packets I intended to last month. Then we might be mourning a Texas Bluebonnet plant this summer. And if there’s one horticulture lesson she needs to learn, it’s don’t mess with the Texas state flower.